The Samford University campus will come alive in late November and through December with the sights and sounds of the Christmas season. The series of events of interest to students, alumni and the general public include traditional events, student activities, and performances hosted by the university’s community arts partners. 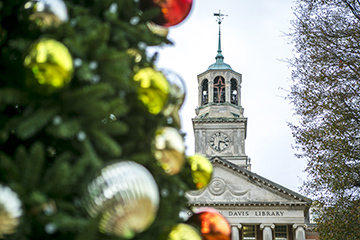 Because of renovations to Samford’s Reid Chapel, two popular Christmas events are on a one-year hiatus: Christmas Around the World, hosted by the Department of World Languages and Cultures, and Hanging of the Green. Retired art professor Lowell Vann returns to campus Nov. 30 for his annual Christmas chalk talk. The 10 a.m. service will be in the Wright Fine Arts Center. For decades, Vann has produced a drawing depicting a biblical scene to scripture reading and music. This event is free. Lighting of the Way, hosted by the Student Activities Council on Nov. 30, begins at 7 p.m. on Centennial Walk. Samford First Lady Jeanna Westmoreland will read the Christmas story. Following that, the Christmas tree will be lit in a sea of bright lights. Refreshments and live music will follow. Samford’s Christenberry Planetarium is offering seven showings of its popular Star of Bethlehem presentation. Dates and times are Nov. 30, 8 p.m.; Dec. 5, 4:30 p.m.; Dec. 7, 8 p.m.; Dec. 12, 10 a.m.; Dec. 14, 8 p.m.; and Dec. 15 at 6 and 8 p.m. Tickets are $12 per person. Private presentations can be arranged for $7 per person with a $350 minimum by calling the planetarium at 205-726-4139. On Dec. 1, Tonight at the Wright presents Act of Congress and the Alabama Symphony Orchestra as part of the Red Diamond SuperPops Series. The popular all-acoustic “progressive bluegrass” group Act of Congress was voted Birmingham's Best Band for 2016 by Birmingham magazine and AL.com. The School of the Arts will present a joint concert by Bells of Buchanan and the Samford Jazz Band Dec. 5 at 7:30 p.m. in Brock Recital Hall. This event is free. The Steven and Gena Vinyard Choral Series presents A Service of Lessons and Carols Dec. 7 at 5:30 p.m. in Hodges Chapel. This service will include the A Cappella Choir, University Chorale and Worship Arts Ensemble. This event is free. Samford Legacy League’s Christmas Home Tour and Holiday Gift Market on Thursday, Dec. 7. will showcase five homes ranging from traditional to contemporary in style. The homes, all located within minutes of Samford’s campus, will be open from 10 a.m. – 2 p.m. and 4 – 8 p.m. At the Samford President’s Home, guests can enjoy refreshments and shopping at the Holiday Gift Market. Proceeds provide scholarships for students with significant financial need and challenging circumstances. Tickets are $25 in advance and $30 at the door. Advance tickets are available online through Dec.5. Opera Birmingham will share Sounds of the Season, a Dec. 8 concert of sacred and secular favorites. The 7:30 p.m. concert is in Brock Recital Hall. Tickets are available from Opera Birmingham. The Alabama Ballet will bring George Balanchine’s The Nutcracker to life at the Wright Center Dec. 8-10 and Dec. 15-17. Alabama Ballet is one of only eight companies in the world licensed by The Balanchine Trust to perform this holiday masterpiece. Ticket and show times are available online.